Dunagep, (Danubian Building Machines Servicing Corporation), one of Hungary’s largest crane rental specialists, has taken delivery of an eight axle 500 tonne Terex AC500-2, its largest All Terrain crane to date. 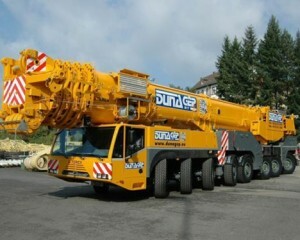 The new crane has a 56 metre main boom plus luffing jib and Superlift attachment, maximum system length it 145.8 metres. The company which is celebrating its 25th anniversary this year, is based in Budapest with subsidiaries in Slovakia and Croatia. It mainly serves the steel, refinery and petrochemical industries, and the crane will make its lifting debut working in an Hungarian power plant.